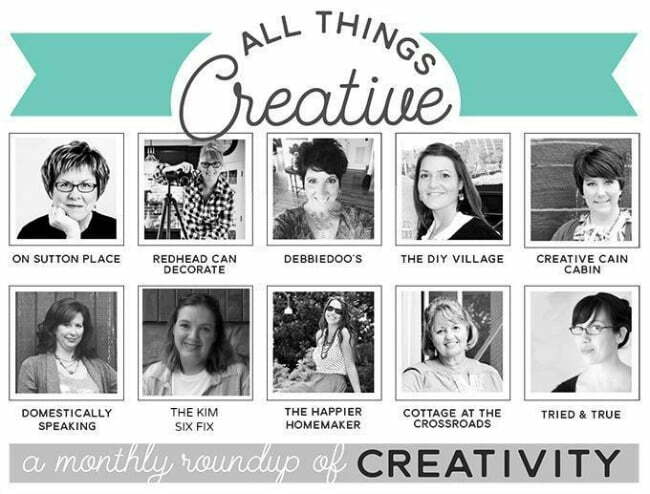 It’s that time again for the All Things Creative Team’s monthly roundup, and this month’s theme is Creative Container Gardening! With the weather warming up, we all have gardening on our minds. I think it’s a rite of spring to pot up some pretty flowers or plant some veggies. And even if you don’t have much space, you can still grow quite a lot using containers. Plain ole pots work great, but it’s even more fun to get creative with your containers. The possibilities are endless and the sky’s the limit! 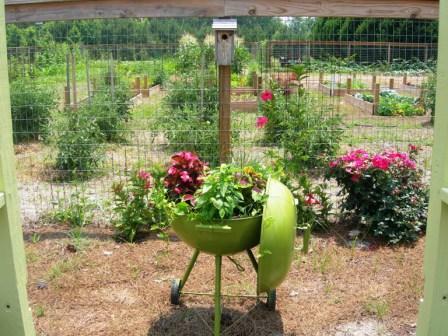 Today I’m linking up our REPURPOSED GRILL PLANTER that we created way back in 2011. Really? Has it been that long ago? If you click on the photo, you can see the original post when we first created it. The grill planter caught the attention of a magazine editor, and the next year a photo appeared in the June 2012 issue of Ladies Home Journal. Oh, those were exciting times! To this day, we still use the grill planter in our garden. She’s lost her legs but she still sits in our herb bed. 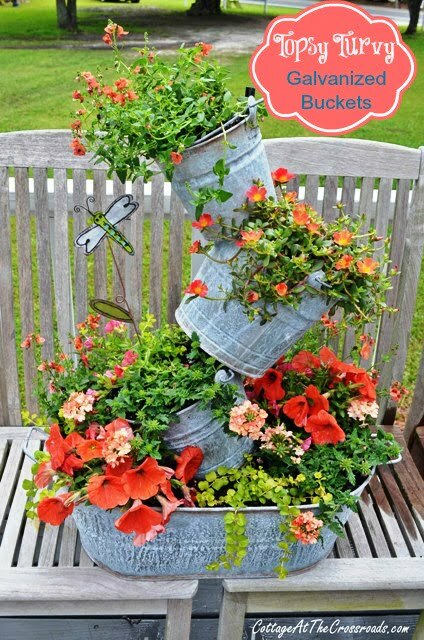 Remember the TOPSY TURVY GALVANIZED BUCKETS that I created several years ago? They’ve been potted up many different ways depending on the season, and I need to get them replanted with some summer annuals. You can click on the photo to find the tutorial on how these were made. 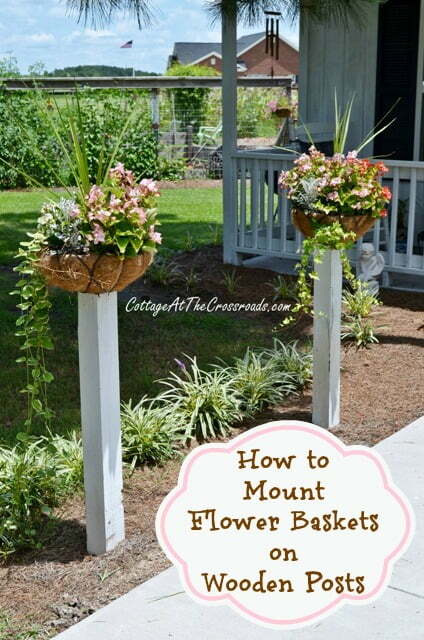 Another idea that I’m linking up is the post I did on HOW TO MOUNT FLOWER BASKETS ON WOODEN POSTS. About 6 years ago, we build my mother an apartment in our backyard, and I was searching for a way to “dress up” the sidewalk leading back to her little house. So I came up with this idea of mounting baskets onto wooden posts. It’s such a great way to add some vertical interest and color, and gives my mother something pretty to look at while she’s sitting on her porch. 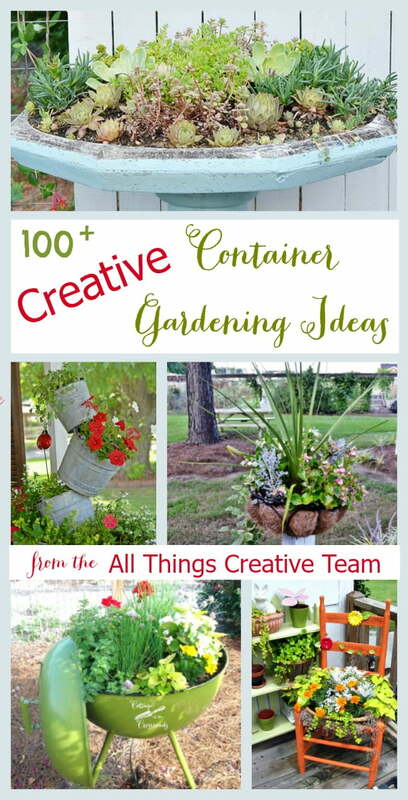 I can’t wait to see more creative container gardening ideas from the rest of the All Things Creative Team because I’m always looking for inspiration for showing some personality in our yard and garden! And I’d like to introduce our newest member of the team-Kim Six! Claire from the blog A Little Clairefication had to drop out due to real job commitments, and we will miss her. But we’re all glad that Kim was willing to step into this crazy and creative bunch! They are, from left to right:Ann from On Sutton Place, Julie from Redhead Can Decorate, Debbie from Debbiedoo’s, Jacque from The DIY Village, Dawn from Creative Cain Cabin, Maryann from Domestically Speaking, Kim from The Kim Six Fix, Melissa from The Happier Homemaker, me, and Vanessa from Tried & True. You do have the cutest and most creative garden ideas!…. What fun Jane, so many creative ideas! I’m off to plant something!